There are so many different aspects of your life where boundaries can be imperative to implement. These can be with a wide range of components including: your friends, family, significant other, profession, or even yourself. It is easy to fall into the trap of allowing other people to impose their boundaries on you. What is not as easy is to simply tell people “no,” especially if you identify as amiable or a people pleaser. But how do you implement them, if it’s very uncomfortable for you? Below is a simple guide on the different times to implement boundaries through the variety boundary pushers that come into your life. Work. It can be very tricky to implement boundaries in your professional life because every work culture and boss differs from position to position and firm to firm. Only you can understand and implement what is expected in your work culture. One way to implement boundaries at work is to not answer emails outside of standard working hours. Practice leaving your work at work, unless there is an emergency or extremely pressing need to be addressed. Friends. While you may love spending time with your friends, sometimes you may just want a quiet night in by yourself. That is okay! In fact, it is encouraged to find time to spend by yourself as that allows for some personal growth. Family. Implementing boundaries with your family can also be tough because of the fact that they are family. One example might be the expectation from them that you visit them every weekend or for every holiday; however, it is important to realize that you also may have plans on those weekends, especially if you have a significant other to also split holidays with. Over time as you start saying “no,” there is a good chance your family will understand that you are moving into adulthood and have other responsibilities, priorities, and are living your own individual life. Significant Other. 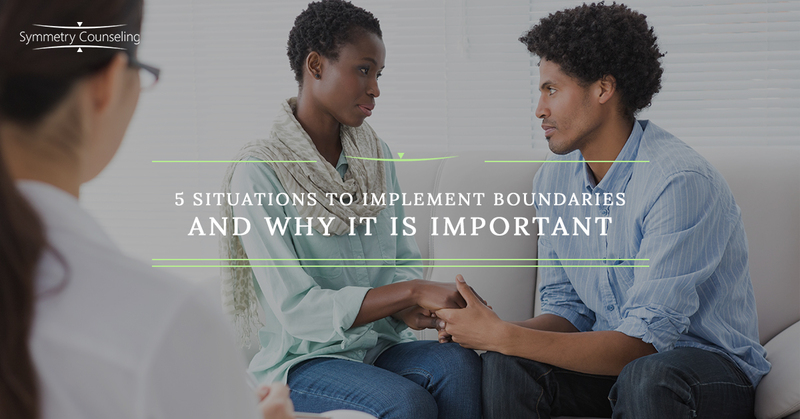 Being in a serious relationship with your significant other can also be another place to consider implementing boundaries. One person may have different expectations of how they want to spend their free time with you. It is important to speak up to your significant other, as no one is a mind reader, especially if you may not want to spend your entire Sunday watching sports with him or her. Yourself. Yes, implementing boundaries with yourself is just as important as all of the above. At the end of the day, it starts with implementing boundaries with yourself that has the ripple effect on how you implement them in other parts of your life. Putting boundaries in place with yourself can look like allowing yourself to have a self-care day and not having to be “busy” all time, whether it is going to a work out class, baking, cooking, journaling, having a spa day or whatever it is that provides you with a way to bring joy into your life. Disclaimer: Implementing boundaries can be very challenging. When you start implementing boundaries, there could be some pushback from those you are implementing boundaries with, as they may not be used to you saying “no” to them. However, at the end of the day, it is important to realize that boundaries can be an essential aspect of healthy emotional functioning. If you are currently struggling with implementing boundaries in your life, it may be a good idea to connect with one of our skilled counselors at Symmetry Counseling today. You can contact them at 312-578-9990 to set up an appointment.